Life's filled with ups and downs; from the good and bad to the just plain nonsensical. But if you can keep going and at times just battle on through, every now and then it can gift you the most incredible opportunity. And it is on these rare occasions that one deserves cake. 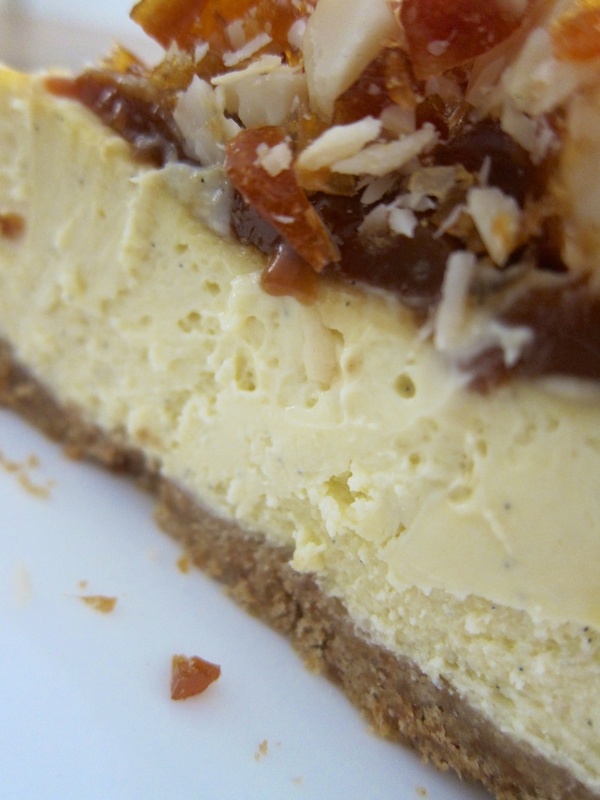 This recipe is a scaled-down version of Yotam Ottolenghi's caramel and macadamia cheesecake, a miniaturisation done in part to alleviate the guilt of such blatantly unnecessary extravagance, but also because I'm not especially fond of cheesecake, preferring to enjoy it infrequently, and in very small doses. But while it may not be my favourite cake of choice it's a good "quick to prepare" option to have in the repertoire and besides, this particular combination sounded simply too good to pass up. The cake itself is reasonably simple - a biscuit base covered in a rich, tangy top. Where the challenge lies is in preparing two different types of caramel, but we're not talking candy thermometers or thread, ball, or crack stages, so there's nothing too technical so long as you keep paying attention. I would aim towards the darker side for the sauce as, to my tastes, the near-bitterness contrasts beautifully with the lush, creamy filling, but feel free to go as light, or dark, as you wish. When it came time to eating the thought of smothering an already decadent cheesecake in double caramel admittedly made my teeth ache, but I was pleasantly surprised by how well the burnt flavours balanced the rich filling and, if anything, made it all seem a little less sweet. There's all manner of textures present; from the crumbly base and smooth, creamy filling, to the gooey sauce and crunchy nut brittle. And to top everything off the profoundly elegant presentation screams of decadence, with just a whisker of overindulgence. Precisely what one needs when life calls for a little celebratory treat. Preheat the oven to 140°C. Lightly grease a 10-cm springform tin* and line the base and sides with baking paper. To make the cake, in a small bowl combine the crushed biscuits and melted butter and mix to a wet, sandy consistency. Transfer to the lined tin and press down to create a flat, level base. In a large mixing bowl, combine the cream cheese, sugar add seeds from the split vanilla pod, and then whisk until smooth. Gradually add the eggs and sour cream to the cream cheese mixture, again whisking until smooth, and then pour the batter over the biscuit base. Tap the cake tin on the bench to level the surface and remove any air bubbles, and then bake for 45-50 minutes until set. The edges should appear firm, while the centre still has a slight wobble. Leave to cool to room temperature and then remove from the tin. Transfer the cake to a serving plate and chill for a couple of hours at the least. 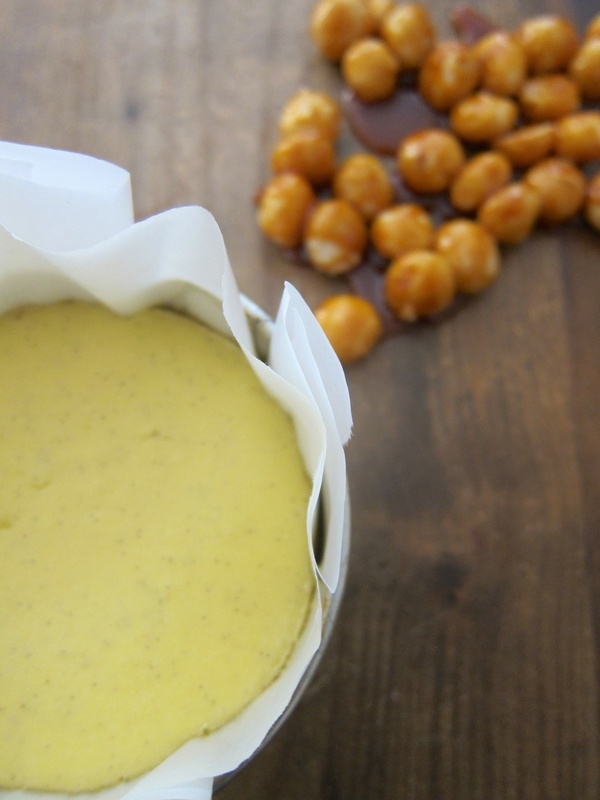 To prepare the topping, roast the macadamia nuts in an oven set to 140°C for approximately 15 minutes until golden. Remove from the oven and set aside. Place the sugar in thin layer across the base of a thick-bottomed saucepan and heat gently, without stirring, until golden-brown in colour. Carefully add the toasted nuts and mix gently with a wooden spoon. Once the nuts are coated with caramel pour onto a baking tray lined with parchment, and leave to set. Break the praline into bits and chop roughly, leaving some of the nuts whole or just halved. For the sauce, put the butter and sugar in a thick-bottomed saucepan and stir constantly over a medium heat until it becomes a smooth, dark caramel. Don't worry if at this stage the butter and sugar appear to have split. Once the desired colour is reached carefully* add the cream while stirring vigorously. Remove from the heat and set aside to cool. To assemble the cake, dust the edges and sides with plenty of icing sugar. Spoon the sauce into the centre*, allowing it to spill over a little, and then pile lots of caramelised nuts on top. The cheesecake will keep in the fridge for 3 days. ** This tin was a bit small for the quantities listed and I ended up with some leftover topping and a couple of bonus mini cheesecakes. You could try using a slightly larger tin, otherwise I think these would also look nice prepared as individual serves. ** If you haven't made this kind of caramel sauce before, BE WARNED! Adding cream causes the caramel to bubble vigorously and release lots of steam, so be very careful when performing this step. Pour the cream in slowly and from the side, and stir constantly to keep the bubbling in check. The mixture will stay hot for a long time so if it's bubbling too quickly just hold back the cream, and then start adding it again once things have settled down a bit (and, whatever you do, resist the temptation to taste-test!). ** If the caramel sauce seems too hard to spread, soften it by briefly returning to the stovetop, or by warming in the microwave for a quick 10-20 seconds.